2. Select Registration Services, then select Defer Pymt/Payr Deduct. 3. A new tab will open in your browser where you can select a Campus and Semester. 4. On the next webpage, you can choose between requesting a Deferred Payment or Payroll Deduction. The University offers a deferred payment plan as a payment option. Eligible students are allowed to defer up to one-half (1/2) of their current semester charges. Payment of one-half (1/2) of current semester charges plus any account balance must be received by the due date. All students are eligible for their initial deferred payment plan. Any future deferred payments are granted based on the individual credit history established with the University. Students who default on a deferred payment plan are ineligible to receive a deferment for one calendar year. 1. A $15 service charge will be assessed on all deferments. To determine your current payment due date, please check your plan on myLSU > Financial Services > Billing Statement, or email bursar@lsu.edu. 3. If payments are not received by the Office of Bursar Operations on or before the tenth (10th) calendar day following the scheduled due date, a five percent (5%) late fee will be assessed. 4. If the amount due plus the 5% late fee is not received within fourteen calendar days after notification of delinquency, the University will withhold grades for the current semester, withhold transcripts and prevent completion of registration for a future semester until the amount due plus a $75 financial reinstatement fee is paid. 5. In the event of withdrawal from the University before complete payment has been made, any credit or refunds due the student as provided for in accordance with current University regulations will be applied to the student's account. The balance must be paid. 6. If necessary for LSU to commence legal action against the student to enforce the terms of this agreement, and the student's account is turned over by the University to an attorney-at-law for collection, by suit or otherwise, the student will be obligated to pay all court costs and legal interest from the date the debts are due (pursuant to LSA-CC article 2000) and $100 or a sum equal to thirty-three and one third percent (33 1/3%) additional of the total amount due and owing as attorney fees, whichever is higher. Full-time, non-faculty, LSU Employees with at least one year of service may elect to pay their fees through payroll deduction. To pay fees through payroll deduction students must follow the procedure listed below. 1. 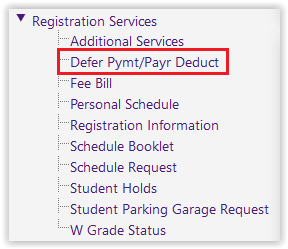 From the myLSU Portal, select payroll deduction as a payment option. This must be done each semester. Graduate Assistants and employees who make this selection must indicate via myLSU, by the due date, that they are completing registration even if the balance is zero. 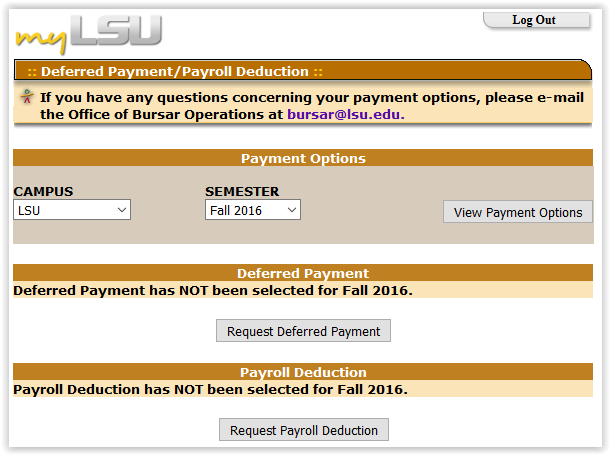 Once fee bills are available, students may not delete payroll deductions via myLSU. Third party payroll deductions cannot be selected via myLSU. The payroll deduction option may be selected until students have completed registration.